Firefighters from the Annandale Hose Company in New Jersey didn't expect a training exercise to end in the actual rescue of seven young lives. On Monday, the firefighters simulated basement and second-floor fires at the Hunterdon County Emergency Service Training Center. 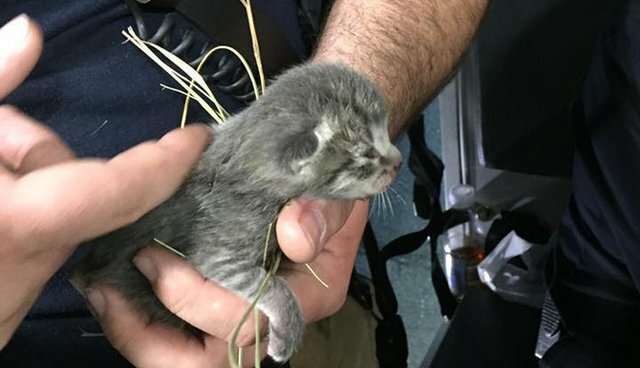 "We got a surprise when seven very fragile, and very scared, kittens were located and rescued inside the burning building," the fire company wrote in a Facebook post. "After conducting one rotation inside this literally hellish environment, a member of the Training Facility found the kittens, which they rescued." From there, the kittens were taken to a waiting ambulance, where they were given oxygen and much-needed comfort. "We are pleased to announce that all the beautiful kittens are doing well and suffered no serious injuries as a result of picking, possibly, the worst temporary housing imaginable," the Facebook post reads. It is unknown where the mother of the kittens was at the time of the rescue. The kittens are now in the care of a local animal rescue.